Not a single one of them will pass you by in the latest from Speed and Strength; glory days that is. As attitude-rich as it is sleeve-poor, the Speed and Strength Glory Daze Women’s Vest keeps it classic through and through. Designed specifically for women riders, the Glory Daze motorcycle vest packs moto-specific protection (and non moto-specific protection) into a stylish outer shell that can be worn both on or off of the motorcycle. In addition the the tailored fit, the Speed & Strength Glory Daze Vest features a CE-approved back protector, as well as a concealed carry pocket. Additional features include a 1” mandarin-style collar, reflective trim for added visibility, and belt loops for attachment to motorcycle pants. 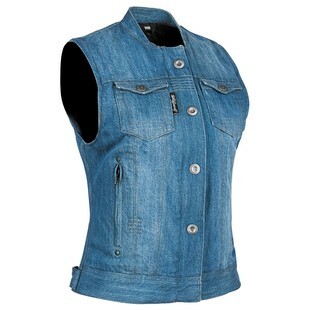 In the world of rugged motorcycle riding, the denim vest is a staple and a statement all in one. Fore the Fall of 2017 Speed and Strength has introduced the Glory Daze denim vest to continue the legacy.